They took two separate rooms. They took two seperate rooms. It took time to separate the dog from its favorite toy. It took time to seperate the dog from its favorite toy. They didn’t want to go to the party separately . They didn’t want to go to the party seperately . They remained best friends even though they were separated by war. They remained best friends even though they were seperated by war. 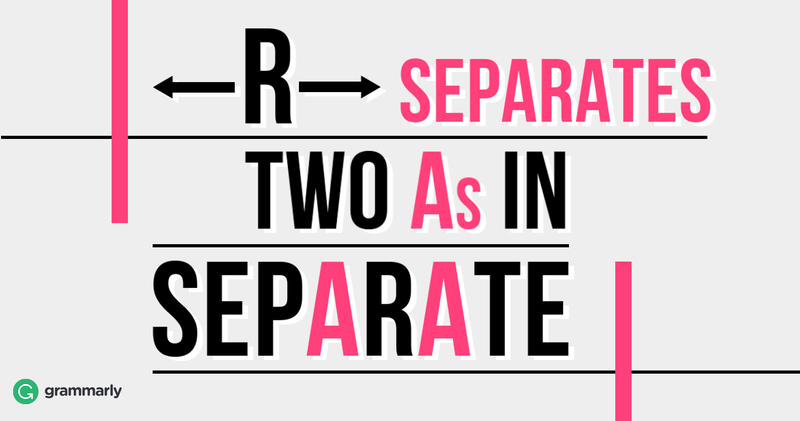 There are a couple of ways to remember the correct spelling of separate. You can remember that the order of the vowels in the word is symmetrical: e-a-a-e. It might be easier to remember that there’s a rat in separate (sep-A-RAT-e). Annapolis police recovered two handguns in separate incidents over the past few days. One, they would get a separate queue at bank branches, along with differently abled persons. On Thursday, Duterte sparked alarm by threatening to separate with the U.S. and ally instead with China. It was a hug nearly five decades in the making as two sisters separated by the Sixties Scoop reunited in Winnipeg on Tuesday.